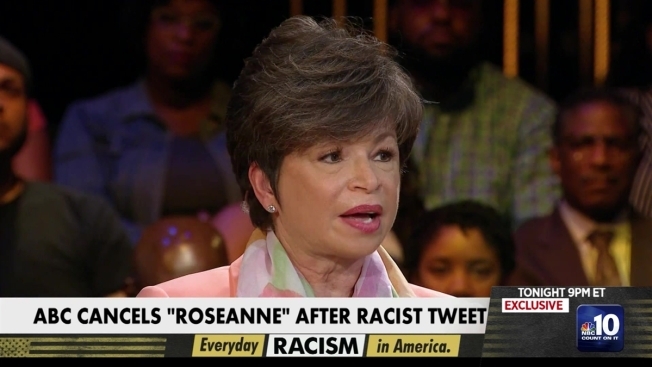 "I think this country is overdue for a truth and reconciliation process in every corner"
Appearing in Philadelphia on Tuesday for an MSNBC forum on race in the United States, former Obama adviser Valerie Jarrett commented on Roseanne Barr's racist tweet about her. You can watch the full event, "Everyday Racism in America", Tuesday night at 9 p.m. on MSNBC. Starbucks' move to close thousands of stores on Tuesday for racial-sensitivity training is a major step in opening a national dialogue on racism, civil rights leaders, policy advisers and people affected by discrimination said at a town hall in Philadelphia Tuesday that aired on MSNBC. "I think this country is overdue for a truth and reconciliation process in every corner," said Heather McGhee, who is president of a public policy organization, Demos, that helped Starbucks prepare for the training. Tuesday brought another example of a corporation dealing with racism: ABC canceling its hit show "Roseanne" hours after the show's star, Roseanne Barr, tweeted a racist comment about former Barack Obama adviser Valerie Jarrett's appearance. Jarrett, who participated in the town hall, called it a "teaching moment" and said other corporations should follow the example set by ABC and Starbucks when confronting racist behavior.